Noam Chomsky on “Crisis and Hope: Theirs and Ours” | Democracy Now! speaking at Riverside Church in Harlem on June 12, 2009. AMY GOODMAN: Today, a Democracy Now! special with one of the most important dissident intellectuals of our time, Noam Chomsky. Born December 7th, 1928, in Philadelphia, by the age of ten he was writing an extended essay against fascism and about the Spanish Civil War. At fourteen, he was in New York, getting his education, as he tells it, in the back of the 72nd Street subway station, where his uncle ran a newspaper stand. The front of the subway station, that’s where people ran in and out buying newspapers quickly. But at the back, a little less trafficked, that’s where people stopped and had political discussions about the news in the papers they did or didn’t buy. At sixteen, he was at the University of Pennsylvania, where he got his doctorate. He became a professor of linguistics at the Massachusetts Institute of Technology at the age of twenty-six. He remained there for more than half a century and continues to teach there today. While Professor Chomsky broke new ground as a world-renowned linguist, shattering all previous paradigms, he was also taking on the war in Vietnam. Throughout his life, he spoke out against US imperialism, from Vietnam to the Indonesian occupation of East Timor, from the death squads in Latin America to the Israeli occupation of Palestine, and now to the wars in Iraq and Afghanistan. Noam Chomsky turned eighty years old this past December. He has written over a hundred books. But despite being called “the most important intellectual alive today” by the New York Times, he is rarely heard or quoted in the mainstream media. Today we spend the hour with Noam Chomsky. He spoke recently here in New York at an event sponsored by the Brecht Forum. More than 2,000 people packed into the Riverside Church in Harlem to hear his address. The title of his talk, “Crisis and Hope: Theirs and Ours.” This is Noam Chomsky. NOAM CHOMSKY: Well, let me say a couple of words about the title, which, as always, is shorthand. There’s too much nuance and variety to make any sharp distinction between us and them. And, of course, neither I nor anyone else can presume to speak for us. But I’ll pretend it’s possible. There’s also a problem about the word “crisis.” Which one do we have in mind? There are numerous very severe crises. Many of them will be under discussion here in a couple of weeks at the United Nations in their conference on the world financial and economic crisis. And these crises are interwoven in very complex ways which make it — which preclude any sharp separation. But again, I’ll pretend otherwise for simplicity. , dated yesterday. The front cover headline reads, “How to Deal with the Crisis.” It features a symposium of specialists. And it’s worth reading, but with attention to the definite article: “the” crisis. For the West, the phrase “the crisis” has a clear enough meaning. It’s the financial crisis that hit the rich countries and therefore is of supreme importance. But, in fact, even for the rich and privileged, that’s by no means the only crisis or even the most severe of those they face. And others see the world quite differently. For example, the newspaper New Nation in Bangladesh. There, we read, “It’s very telling that trillions have already been spent to patch up leading world financial institutions, while out of the comparatively small sum of $12 billion pledged in Rome earlier this year, to offset the food crisis, only $1 billion has been delivered. The hope that at least extreme poverty can be eradicated by the end of 2015, as stipulated in the UN’s Millennium Development Goals, seems as unrealistic as ever, not due to lack of resources but to a lack of true concern for the world’s poor.” That’s — they’re talking about approximately a billion people facing starvation, severe malnutrition, even 30 or 40 million of them in the richest country in the world. That’s a real crisis, and it’s getting much worse. In this morning’s Financial Times, British business press, it’s reported that the World Food Program just announced that they’re cutting food aid and rations and also closing operations. The reason is that the donor countries have been cutting back in funding because of the fiscal crunch, and they’re slashing contributions. So, a very close connection between the horrendous food crisis and poverty crisis and the significant, but less significant, fiscal crisis. They’re ending up closing down operations in Rwanda, in Uganda, Ethiopia, many others. They have to — 20 to 25 percent cut in budget, while food prices are rising, and the financial crisis, the general economic crisis, is bringing unemployment and cutting back remittances. That’s a major crisis. We might, incidentally, remember that when the British landed in what’s now Bangladesh, they were stunned by its wealth and splendor. And it didn’t take very long for it to be on its way to become the very symbol of misery, not by an act of God. Well, the fate of Bangladesh should remind us that the terrible food crisis is not just a result of Western lack of concern. In large part, it results from very definite and clear concerns of the global managers, namely for their own welfare. It’s always well to keep in mind a astute observation by Adam Smith about policy formation in England. He recognized that what he called the “principal architects” of policy — in his day, the merchants and manufacturers — make sure that their own interests are most peculiarly attended to, however grievous the impact on others, including the people of England, but far more so those who were subjected to what he called the “savage injustice of the Europeans,” and particularly in conquered India, his own prime concern. We can easily think of analogs today. His observation, in fact, is one of the few solid and enduring principles of international and domestic affairs well to keep in mind. And the food crisis is a case in point. It erupted first and most dramatically in Haiti in early 2008. Like Bangladesh, Haiti is a symbol of utter misery. And like Bangladesh, when the European explorers arrived, they were stunned because it was so remarkably rich in resources. Later it became the source of much of France’s wealth. I’m not going to run through the sordid history. It’s worth knowing. But the current food crisis traces back directly to Woodrow Wilson’s invasion of Haiti, which was murderous and brutal and destructive. Among Wilson’s many crimes was to dissolve the Haitian parliament at gunpoint, because it refused to pass what was called progressive legislation, which would allow US businesses to take over Haitian lands. Wilson’s marines then ran a free election, in which the legislation was passed by 99.9 percent of the vote. That’s of the five percent of the population permitted to vote. All of this comes down to us as what’s called Wilsonian idealism. Later, USAID instituted programs in Haiti to turn it — under the slogan of turning Haiti into the Taiwan of the Caribbean by adhering to the sacred principle of comparative advantage. That is, they should import from the United States, while working people, mostly women, slaved under miserable conditions in US-owned assembly plants. Haiti’s first free election in 1990 threatened these economically rational programs. The poor majority made the mistake of entering the political arena and electing their own candidate, Jean-Bertrand Aristide, a populist priest. And Washington instantly adopted standard operating procedures: the moving at once to undermine the regime. A couple of months later came the military coup, instituting a horrible reign of terror, which was backed by Bush, Bush I, and even more so by Clinton. By 1994, Clinton decided that the population was sufficiently intimidated, and he sent US forces to restore the elected president — that’s now called a humanitarian intervention — but on very strict conditions, namely that the president had to accept a very harsh neoliberal regime, in particular, no protection for the economy. Haitian rice farmers are quite efficient, but they can’t compete with US agribusiness that relies on a huge government subsidy, thanks to Ronald Reagan’s free market enthusiasms. Well, there’s nothing at all surprising about what followed next. In 1995, USAID wrote a report pointing out, and I’m quoting it, that “the export-driven trade and investment policy” that Washington mandated will “relentlessly squeeze the domestic rice farmer.” In fact, the neoliberal policies rammed down Haiti’s throat destroyed, dismantled what was left of economic sovereignty, drove the country into chaos, and that was accelerated by Bush Number Two’s banning of international aid, on totally cynical grounds. In February 2004, the two traditional torturers of Haiti — France and the United States — combined to back a military coup and send President Aristide off to Africa. The US denies him permission to return to the entire region. Haiti had by then lost the capacity to feed itself, making it highly vulnerable to food price fluctuation. That was the immediate cause of the 2008 food crisis, which led to riots and enormous protest, but not getting food. The story is familiar, in fact quite similar, in much of the world. So, going back to the Bangladesh newspaper, it’s true enough that the food crisis results from Western lack of concern — a pittance by our standards would overcome its worst immediate effects — but more fundamentally, it results from the dedication to Adam Smith’s principles of business-run state policy. These are all matters that we too easily evade. They happen daily. Along with the fact that bailing out banks is not uppermost in the minds of the billion people now facing starvation, not forgetting the tens of millions enduring hunger in the richest country in the world, well, also sidelined is an easy way to make a significant dent in the financial and the food crises. It’s suggested by the publication a couple days ago of the authoritative annual report on military spending by SIPRI, the Swedish peace research institute, the scale of military spending is phenomenal, regularly increasing, this last year as well. Now, the US is responsible for almost as much as the rest of the world combined, seven times as much as its nearest rival, China. No need to waste time commenting. This distribution of concerns reflects another crisis here, kind of a cultural crisis, that is the tendency to focus on short-term parochial games. That’s a core element of our socioeconomic institutions and the ideological support system on which they rest. One example, now prominent, is the array of perverse incentives that are devised for corporate managers to enrich themselves. And, for example, what’s called the “too big too fail” insurance policies that are provided by the unwitting public. And deeper ones. They’re just inherent in market inefficiencies. One such inefficiency, now recognized to be one of the roots of the financial crisis, is the under-pricing of systemic risk, a risk that affects the whole system. So, for example — and that’s general, like if you and I make a transaction, say, you sell me a car, we may make a good deal for ourselves, but we don’t price into that transaction the cost to others. And there’s a cost: pollution, congestion, raising the price of gas, all sorts of other things, killing people in Nigeria because we’re getting the gas from them. That doesn’t count when we — we don’t count that in. That’s an inherent market inefficiency, one of the reasons why markets can’t work. And when you turn to the financial institutions, it can get quite serious. So it means that if, say, Goldman Sachs, if they’re managed properly, if they make a risky loan, they calculate the potential cost to themselves if the loan goes bad, but they simply don’t calculate the impact on the whole financial system. And we now see how severe that can be, not that it’s anything new. In fact, this inherent deficiency of markets, this inefficiency of markets, was perfectly well known ten years ago, at the height of the euphoria about efficient markets. Two prominent economists, John Eatwell and Lance Taylor, they wrote an important book, in which — called Global Finance at Risk, in which they spelled out the consequences of these market inefficiencies, which we now see, and they outlined means to deal with them. These proposals were exactly contrary to the deregulatory rage that was then being carried forward by the Clinton administration, under the leadership of those who Obama has now called upon to put band-aids on the disaster that they helped create. Well, in substantial measure, the food crisis plaguing much of the South and the financial crisis of the North have common roots, namely the shift towards neoliberalism since the 1970s. That brought to an end the postwar, post-Second World War, Bretton Woods system that was instituted by the United States and Britain right after World War II. It had two architects: John Maynard Keynes of Britain and Harry Dexter White in the United States. And they anticipated that its core principles, which included capital controls and regulated currencies — they anticipated that these principles would lead to relatively balanced economic growth and would also free governments to institute the social democratic programs, welfare state programs, that had enormous public support around the world. And to a large extent, they were vindicated on both counts. In fact, many economists call the years that followed, until the 1970s, the “Golden Age of Capitalism.” That Golden Age led not only to unprecedented and relatively egalitarian growth, but also the introduction of welfare state measures. Keynes and White were perfectly well aware that free capital movement and speculation inhibit these options. Professional economics literature points out what should be obvious, that the free flow of capital creates what is sometimes called a “virtual senate” of lenders and investors who carry out a moment-by-moment referendum on government policies, and if they find that they’re irrational, meaning they help people instead of profits, then they vote against them, by capital flight, by tax on the country, and so on. So the democratic governments have a dual constituency, their own population and the virtual senate, who typically prevail. And for the poor, that means regular disaster. In fact, one of the differences — one of the reasons for the radical difference between Latin America and East Asia in the last half-century is that Latin America didn’t control capital flight. In fact, in general, the rich in Latin America don’t have responsibilities. Capital flight approximated the crushing debt. In contrast, during South Korea’s remarkable growth period, capital flight was not only banned, but could bring the death penalty, one of many factors that led to the surprising divergence. Latin America has much richer resources. You’d expect it to be far more advanced than East Asia, but it had the disadvantage of being under imperialist wings. AMY GOODMAN: MIT professor and author, Noam Chomsky, speaking about “Crisis and Hope: Theirs and Ours” at Riverside Church in Harlem. If you’d like a copy of today’s show, you can go to our website at democracynow.org. When we come back from break, Chomsky on the US wars in Iraq and Afghanistan. Stay with us. AMY GOODMAN: Earthdriver performing live at Riverside Church in Harlem, where more than 2,000 people packed in to hear the renowned MIT professor, author and activist, Noam Chomsky. We return to his address called “Crisis and Hope: Theirs and Ours.” Noam Chomsky spoke about US foreign policy and the wars in Iraq, Afghanistan and Pakistan. NOAM CHOMSKY: In AfPak, Afghanistan-Pakistan, as the region is now called, Obama is building enormous new embassies and other facilities on the model of the city within a city in Baghdad. These are like no embassies anywhere in the world. And they are signs of an intention to be there for a long time. Well, while Obama’s signaling very clearly his intention to establish a firm and large-scale presence in the region, he’s also, as you know, sharply escalating the AfPak war, following Petraeus’s strategy to drive the Taliban into Pakistan, with potentially awful results for this extremely dangerous and unstable state, which is facing insurrections throughout its territory. These are the most extreme in the tribal areas, which cross the AfPak border. It’s an artificial line imposed by the British called the Durand Line, and the same people live on both sides of it — Pashtun tribes — and they’ve never accepted it. And, in fact, the Afghanistan government never accepted it either, as long as it was independent. Well, that’s where most of the fighting is going on. One of the leading specialists on the region, Selig Harrison, he recently wrote that the outcome of Washington’s current policies, Obama’s policies, might well be, what he calls them, “Islamic Pashtunistan,” Pashtun-based separate kind of quasi-state. The Pakistani ambassador warned that if the Taliban and Pashtun nationalism merge, we’ve had it. And we’re on the verge of that. The prospects become still more ominous with the escalation of drone attacks that embitter the population with their huge civilian toll, and more recently, just a couple days ago, in fact, with the unprecedented authority that has just been granted to General Stanley McChrystal, who’s taking charge. He’s a kind of a wild-eyed Special Forces assassin. He’s been put in charge of heading the operations. Petraeus’s own counterinsurgency adviser in Iraq, General David Kilcullen — Colonel, I think — he describes the Obama-Petraeus-McChrystal policies as a fundamental “strategic error” which may lead to the collapse of Pakistan. He says it’s a calamity that would “dwarf” all other current issues, given the country’s size, strategic location and nuclear stockpile. It’s also not too encouraging that Pakistan and India are now rapidly expanding their nuclear arsenals. Pakistan’s nuclear arsenals were developed with Reagan’s crucial aid. And India’s nuclear weapons program got a major shot in the arm with the recent US-India nuclear agreement. It’s also a sharp blow to the Non-Proliferation Treaty. 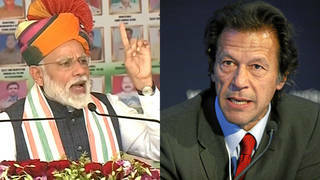 Two countries have twice come close to nuclear war over Kashmir, and they’re also engaged in a kind of a proxy war in Afghanistan. These developments pose a very serious threat to world peace, even to human survival. Well, a lot to say about this crisis, but no time here. Coming back home, whether the deceit here about the monstrous enemy was sincere or not — Johnson’s case might well have been sincere — suppose that, say, fifty years ago Americans had been given a choice of directing their tax money to development of information technology, so that their grandchildren could have iPods and the internet, or else putting the same funds into developing a livable and sustainable socioeconomic order. Well, they might very well have made the latter choice. But they had no choice. Now, that’s standard. There’s a striking gap between public opinion and public policy on a host of major issues, domestic and foreign. And, at least in my judgment, public opinion is often a lot more sane. It also tends to be fairly consistent over time, which is pretty astonishing, because public concerns and aspirations, if they’re even mentioned, are marginalized and ridiculed. It’s one very significant feature of the yawning democratic deficit, as we call it in other countries. That’s the failure of formal democratic institutions to function properly. And that’s no trivial matter. Arundhati Roy has a book, soon to come out, in which she asks whether the evolution of formal democracy in India and the United States, in fact, not only there — her words — might turn out to be the “endgame of the human race.” And that’s not an idle question. Well, all through American history, there’s been a constant struggle over this constrained version of democracy. And popular struggles have won a great many rights. Nevertheless, concentrated power and privilege clings to the Madisonian conception, changes form as circumstances change. By World War II, there was a significant change. Business leaders and elite intellectuals recognized that the public had won enough rights so that they can’t be controlled by force, so it would be necessary to do something else, namely to turn to control of attitudes and opinions. These were the days when the huge public relations industry emerged in the freest countries in the world, Britain and the United States, where the problem was most severe. The public relations industry was devoted to what Walter Lippmann approvingly called a “new art” in the practice of democracy, the “manufacture of consent.” It’s called the “engineering of consent” in the phrase of his contemporary Edward Bernays, one of the founders of the PR industry. Both Lippmann and Bernays had taken part in Woodrow Wilson’s state propaganda agency, which Committee on Public Information was its Orwellian term. It was created to kind of — to try to drive a pacifist population to jingoist fanaticism and hatred of all things German. And it succeeded — brilliantly, in fact. And it was hoped that the same techniques could ensure that what are called the “intelligent minorities” would rule, and that the general public, who Lippmann called “ignorant and meddlesome outsiders,” would serve their function as spectators, not participants. These are all very highly respected progressive essays on democracy by people who — by a man who was the leading public intellectual of the twentieth century and was a Wilson-Roosevelt-Kennedy progressive, as Bernays was. And they capture the thinking of progressive opinion. So, President Wilson, he held that an elite of gentlemen with “elevated ideals” must be empowered to preserve “stability and righteousness,” essentially the perspective of the founding fathers. In more recent years, the gentlemen are transmuted into the “technocratic elite” and the “action intellectuals” of Camelot, “Straussian” neocons and other configurations, but throughout one or another variant of the doctrine prevails. The quote from Samuel Huntington that you heard is an example. And on a more hopeful note, a popular struggle continues to clip its wings, quite impressively in the wake of 1960s activism, which had quite a substantial effect on civilizing the society and raised the prospects for further progress to a much higher plane. It’s one of the reasons why it’s called the “time of troubles” and bitterly denounced, too much of a civilizing effect. Well, what the West sees as the crisis, namely the financial crisis, now that will presumably be patched up somehow or other, but leaving the institutions that created it pretty much in place. A couple of days ago, the Treasury Department, as you read, permitted early TARP repayments, which actually reduce capacity. I mean, it was touted as giving money back to the public. In fact, as was pointed out right away, it reduces the capacity of banks to lend, although it does allow them to pour money into the pockets of the few who matter. And the mood on Wall Street was captured by two Bank of New York employees who predicted that their lives and pay would improve, even if the broader economy did not. That’s paraphrasing Adam Smith’s observation that the architects of policy protect their own interests, no matter how grievous the effect on others. And they are the architects of policy. Obama made sure to staff his economic advisers from that sector, which has been pointed out, too. The former chief economist of the IMF, Simon Johnson, pointed out that the Obama administration is just in the pocket of Wall Street. As he put it, “Throughout the crisis, the government has taken extreme care not to upset the interests of the financial institutions or to question the basic outlines of the system that got us here.” And the “elite business interests” who “played a central role in creating the crisis…with the implicit backing of the government,” they’re still there, and they’re “now using their influence to prevent precisely” the set of “reforms that are needed, and fast, to pull the economy out of its nosedive.” He says, the economy — “The government seems helpless, or unwilling, to act against them,” which is no surprise, considering who constitutes and who backs the government. that I mentioned, article by Bill McKibben. He’s been warning for years about the dire impact of global warming. His current article, worth reading, it relies on the British Stern report, which is sort of the gold standard now. On this basis, he concludes, not unrealistically, that “2009 may well turn out to be the decisive year in the human relationship with our home planet.” The reason is that there’s a conference in December in Copenhagen, which is supposed to set up a new global accord on global warming. And he says it will tell us “whether or not our political systems are up to the unprecedented challenge that climate change represents.” He thinks that the signals are “mixed.” To me, that seems kind of optimistic, unless there’s really a massive public campaign to overcome the insistence of the managers of the state-corporate sector on privileging short-term gain for the few over the hope that their grandchildren might have a decent future. AMY GOODMAN: MIT professor and author, Noam Chomsky, speaking about “Crisis and Hope: Theirs and Ours” at Riverside Church in Harlem. When we come back, Chomsky on the environment and climate change. If you’d like a copy of today’s show, you can go to our website at democracynow.org. Back in a minute. NOAM CHOMSKY: A couple days ago, a group of MIT scientists released the results of what they describe as “the most comprehensive modeling yet carried out on the likelihood of how much hotter the Earth’s climate will get in this century,” which “shows that without rapid and massive action, the problem will be about twice as severe as previously estimated” a couple years ago. And it “could be even worse than that,” because their model does not fully incorporate positive feedbacks that can occur. For example, the increased temperature that is causing a melting of permafrost in the Arctic regions, which is going to release huge amounts of methane. It’s worse than CO2. The leader of the project says, “There’s no way the world can or should take these risks.” He says, “The least-cost option to lower the risk is to start now and steadily transform the global energy system over the coming decades to low or zero greenhouse gas-emitting technologies.” And there’s very little sign of that. Well, furthermore, while new technologies are essential, the problems go well beyond that. In fact, they go beyond the current technical debates about just how to work out cap-and-trade devices being discussed in Congress. We have to face something much more far-reaching. We have to face up to the need to reverse the huge state-corporate and social engineering projects of the post-Second World War period, which very consciously — I mean, they very consciously promoted an energy-wasting and environmentally destructive fossil fuel economy; didn’t happen by accident. That’s the whole massive project of suburbanization, then destruction and later gentrification of inner cities. The state-corporate program began with a conspiracy by General Motors, Firestone Rubber, Standard Oil of California to buy up and destroy efficient electric transportation systems in Los Angeles and dozens of other cities. They were actually convicted of criminal conspiracy and given a tap on the wrist, I think a $5,000 fine. The federal government then took over. It relocated infrastructure and capital stock to suburban areas and also created a huge interstate highway system under the usual pretext of defense. Railroads were displaced by government-financed motor and air transport. The public played almost no role, apart from choosing within the narrowly structured framework of options that are designed by state-corporate managers. They were supported by vast campaigns to “fabricate” consumers with “created wants,” borrowing Veblen’s terms. One result is the atomization of the society and the entrapment of isolated individuals with huge debts. These efforts grew out of the recognition, that I mentioned, a century ago that democratic achievements have to be curtailed by shaping attitudes and beliefs, as the business press put it, directing people to superficial things of life, like fashionable consumption. All of that’s necessary to ensure that the opulent minority are protected from ignorant and meddlesome outsiders, namely the population. Let me just add a personal note on that. I came down here this afternoon by the Acela, you know, the jewel in the crown of new high-speed railroad technology. The first time I came from Boston to New York was sixty years ago. And there was improvement since then: it was five minutes faster today than it was sixty years ago. While state-corporate power was vigorously promoting the privatization of life and maximal waste of energy, it was also undermining the efficient choices that the market doesn’t and can’t provide. That’s another highly destructive built-in market inefficiency. So, to put it simply, if I want to get home from work in the evening, the market does allow me a choice between, say, a Ford and a Toyota, but it doesn’t allow me a choice between a car and a subway, which would be much more inefficient. And maybe everybody wants it, but the market doesn’t allow that choice. That’s a social decision. And in a democratic society, it would be the decision of an organized public. But that’s just what the elite attack on democracy seeks to undermine. Now, these consequences are right before our eyes in ways that are sometimes surreal. A couple of weeks ago, the Wall Street Journal had an article reporting that the US Transportation chief is in Spain. He’s meeting with high-speed rail suppliers. Europe’s engineering and rail companies are lining up for some potentially lucrative US contracts for high-speed rail projects. That stake is $13 billion in stimulus funds that the Obama administration is allocating to upgrade existing rail lines and build new ones that would one day rival Europe’s. So think what’s happening. Spain and other European countries are hoping to get US taxpayer funding for high-speed rail and related infrastructure. And at the very same time, Washington is busy dismantling leading sectors of US industry, ruining the lives of workers and communities who could easily do it themselves. It’s pretty hard to conjure up a more damning indictment of the economic system that’s been constructed by state-corporate managers. Surely, the auto industry could be reconstructed to produce what the country needs using its highly skilled workforce. But that’s not even on the agenda. It’s not even being discussed. Rather, we’ll go to Spain, and we’ll give them taxpayer money for them to do it, while we destroy the capacity to do it here. It’s been done before. So, during World War II, it was kind of a semi-command economy, government-organized economy. The whole — that’s what happened. Industry was reconstructed for the purpose of war, dramatically. It not only ended the Depression, but it initiated the most spectacular period of growth in economic history. In four years, US industrial production just about quadrupled, and that — as the economy was retooled for war. And that laid the basis for the Golden Age that followed. Well, warnings about the purposeful destruction of US productive capacity have been familiar for decades, maybe most prominently by the late Seymour Melman, whom many of us knew well. Melman was also one of those who pointed the way to a sensible way to reverse the project — the process. The state-corporate leadership, of course, has other commitments. But there’s no reason for passivity on the part of the public, the so-called stakeholders, workers and community. I mean, with enough popular support, they could just take over the plants and carry out the task of reconstruction themselves. It’s not a very exotic proposal. One of the standard texts on corporations in economics literature points out that “Nowhere…is it written in stone that the short-term interests of corporate shareholders in the United States deserve a higher priority than…all other corporate stakeholders” — workers and community, that’s it. State-corporate decision has nothing to do with economic theory. It’s also important to remind ourselves that the notion of workers’ control is as American as apple pie. It’s kind of been suppressed, but it’s there. In the early days of the Industrial Revolution in New England, working people just took it for granted that those who work in the mills should own them. And they also regarded wage labor as different from slavery, only in that it was temporary. Also Abraham Lincoln’s view. There have been immense efforts to drive these thoughts out of people’s heads, to win what the business world calls “the everlasting battle for the minds of men.” On the surface, they may appear to have succeeded, but I don’t think you have to dig too deeply to find out that they’re latent and they can be revived. And there have been some important concrete efforts. One of them was undertaken thirty years ago in Youngstown, Ohio, where US Steel was going to shut down a major facility that was at the heart of this steel town. And there were substantial protests by the workforce and by the community. Then there was an effort, led by Staughton Lynd, to bring to the courts the principle that stakeholders should have the highest priority. Well, the effort failed that time. But with enough popular support, it could succeed. And right now is a propitious time to revive such efforts, although it would be necessary — and we have to do this — to overcome the effects of this concentrated campaign to drive our own history and culture out of our minds. There was a very dramatic illustration of the success of this campaign just a few months ago. In February, President Obama decided to show his solidarity with working people. He went to Illinois to give a talk at a factory. The factory he chose was the Caterpillar corporation. Now, that was over the strong objections of church groups, peace groups, human rights groups, who protested — were protesting Caterpillar’s role in providing what amount to weapons of mass destruction in the Israeli Occupied Territories. Apparently forgotten, however, was something else. In the 1980s, after Reagan had dismantled the air traffic controllers’ union, the Caterpillar managers decided to rescind their labor contract with the United Auto Workers and to destroy the union by bringing in scabs to break a strike. That was the first time that had happened in generations. Now, that practice is illegal in other industrial countries, apart from South Africa at the time. Not now. Now the United States is in splendid isolation, as far as I’m aware. Well, at that time, Obama was a civil rights lawyer in Chicago, and he certainly read the Chicago Tribune, which ran quite a good, very careful study of these events. They reported that the union was stunned to find that unemployed workers crossed the picket line with no remorse, while Caterpillar workers found little moral support in their community. This is one of the many communities where the union had lifted the standard of living for entire communities. Wiping out these memories is another victory in the relentless campaign to destroy workers’ rights and democracy, which is constantly waged by the highly class-conscious business classes. Now, the union leadership had refused to understand. It was only in 1978 that UAW president Doug Fraser recognized what was happening and criticized the leaders of the business community — I’m quoting him — for waging a “one-sided class war” in this country, a “war against working people, the unemployed, the poor, the minorities, the very young and the very old, and even many in the middle class of our society,” and for having “broken and discarded the fragile, unwritten compact previously existing during a period of growth and progress.” That was 1979. And, in fact, placing one’s faith in a compact with owners and managers is a suicide pact. The UAW is discovering that right now, as the state-corporate leadership proceeds to eliminate the hard-fought gains of working people while dismantling the productive core of the economy and sending the Transportation Secretary to Spain to get them to do what American workers could do, at taxpayer expense, of course. Well, that’s only a fragment of what’s underway, and it highlights the importance of short- and long-term strategies to build — in part, resurrect — the foundations of a functioning democratic society. One short-term goal is to revive a strong independent labor movement. In its heyday, it was a critical base for advancing democracy and human and civil rights. It’s a primary reason why it’s been subjected to such unremitting attack in policy and propaganda. An immediate goal right now is to pressure Congress to permit organizing rights, the [Employee] Free Choice Act legislation. That was promised but now seems to be languishing. And a longer-term goal is to win the educational and cultural battle that’s been waged with such bitterness in the one-sided class war that the UAW president perceived far too late. That means tearing apart an enormous edifice of delusions about markets, free trade and democracy that’s been assiduously constructed over many years and to overcome the marginalization and atomization of the public.